The Hotel Marina Bay is a 3-star superior hotel in Miramare di Rimini, open all year. It has parking, WI-FI and services for disabled people. Celiac cooking, equipped for cyclists. Small and medium sized pets allowed. 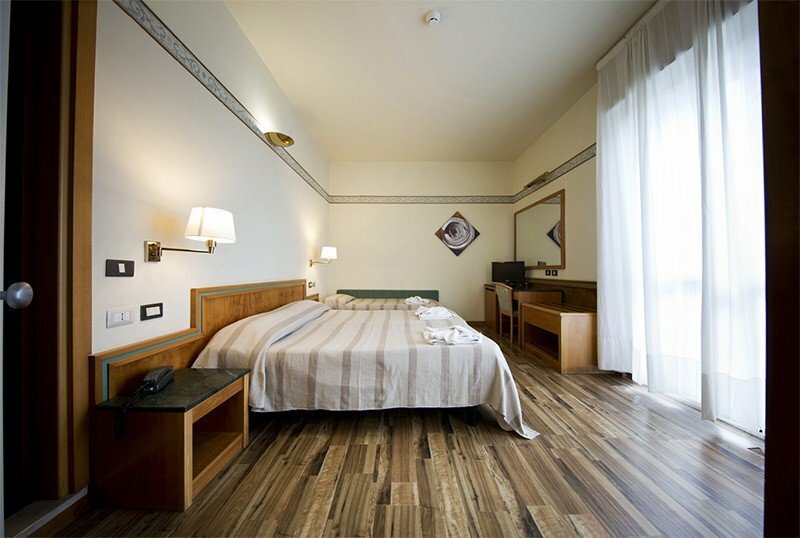 The hotel is located in Miramare di Rimini, just a few steps from the beach and the promenade. The Terme di Rimini can be reached in about fifteen minutes on foot. Balcony, sea view on reservation, renovated furnishings, parquet, air conditioning, 24 "LED and digital terrestrial TV, WI-FI, minibar, safe, telephone, private bathroom with shower (not single) and courtesy set, hairdryer Possibility of breakfast served in the room. FAMILIES: available connecting rooms and solutions for families. Garden, bicycles, terrace, conference room, reading room, lift, satellite TV, laundry, newspapers. The facility is equipped for cyclists. PARKING: uncovered parking in the hotel (limited places), garage in front of the building (places for everyone, for a fee). AIR CONDITIONING : in the common areas and in an individually controlled room. AGREEMENTS : beach, amusement parks, discos, spas, organized excursions and shuttle service. SERVICES FOR DISABLED PEOPLE : entrance located on the ground floor with lift, standard lift, 1 room with wheelchair space, shower with wheelchair access. DOMESTIC ANIMALS : small pets allowed, even at the affiliated beaches. LUNCH AND DINNER : choice between three or more meat and fish based menus, accompanied by mixed starters. Traditional Romagna recipes with homemade pasta and desserts. Water, wine, beer and soft drinks included in the all inclusive formula. VARIATIONS : vegetarian cuisine. On request: vegan dishes for celiacs. In the hotel : strollers, outdoor playground area, bottle warmer, babysitting service and pediatrician. At meals : guaranteed flexible hours, table seats, baby menu, baby food preparation, afternoon snack on request. The Hotel Marina Bay has an agreement with Bagno 133. Playgrounds, WI-FI area, pet area, children's playground area, magazines and newspapers, entertainment are available at the establishment. Offer for the entire month of May Children free up to 3 years and up to 10 years at 50%. Contact us to know more discounts reserved for you. Agreement with all the parks of the Riviera. Children free up to 3 years and up to 10 years at 50% for the entire month of June and July in room with 2 paying adults. Contact us for a personalized quote and to know more discounts reserved for you. Agreement with all the parks of the Riviera. Special offer for the entire month of September free children up to 3 years in a room with 2 paying adults and up to 10 years at 50%. The hotel Marina Bay has decided to offer you for the Easter period full board treatment for only € 50.00 per person per day with included in the price bed breakfast buffet sweet or savory lunch and dinner with 3 menus with water and drinks at meals . The hotel Marina Bay has decided to offer you for the period between 25.04 and 28.04 full board treatment for only € 50.00 per person per day with included in the price sleeping in rooms equipped with every comfort breakfast buffet sweet and savory lunch and dinner with 3 menu of meat and fish with water and drinks at meals. Last Minute Offer valid for a minimum stay of 5 nights in all treatments for the summer 2019 Excluding periods of fairs and weekends. Special agreements for all parks! The hotel Marina Bay has decided to offer you a B & B treatment for only € 30.00 per person per night and with a very small supplement possibility of half board and full board. Also included in the price is a covered and reserved carport.